Karl Lagerfeld has shown us all the beauty of Chanel, after presenting a magical yet beautiful Spring/Summer 2012 collection by taking a deep sea dive into the wonders of the oceans. However a month has past and it is now October. 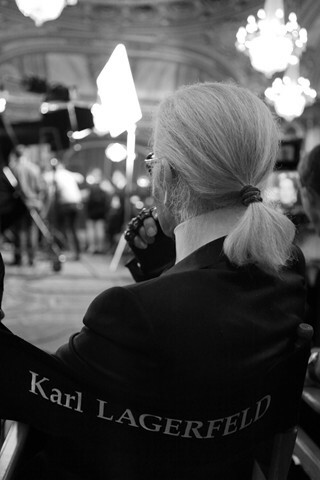 Lagerfeld is still working away on new projects and giving an insight of what it is like to be in shoes. If you were Karl Lagerfeld in a week of a new month, after Paris fashion week means reviews and interviews one after the other about his work, personal life, his creativity, and the world of Chanel. Vogue.com Contributor Coco Rocha starts of the week with what’s it like to work with Karl Lagerfeld. Rocha summed it as there is nothing quite likes doing a photoshoot for Karl Lagerfeld. Rocha has recently worked with the Chanel legend, when he starred as his Macy’s campaign star; which was photographed in Lagerfeld’s own personal library in Paris. Rocha described a shoot they were doing in the evening, were making very late nights and early mornings but he still manage to look after his team in the most glamour’s way. Even a model gave her view on Lagerfeld describing that “Macy’s wanted the backdrop of the library because it’s a famous, ionic now”. She even described that Lagerfeld has so many books that even when they were doing their makeup, they pretty much sitting on books. Rocha told the New York Magazine “He has as a chef on staff, amazing food; his waiter, who holds his diet coke. Rocha described how Lagerfeld reviews the most amazing luxury and he makes everything super luxurious.